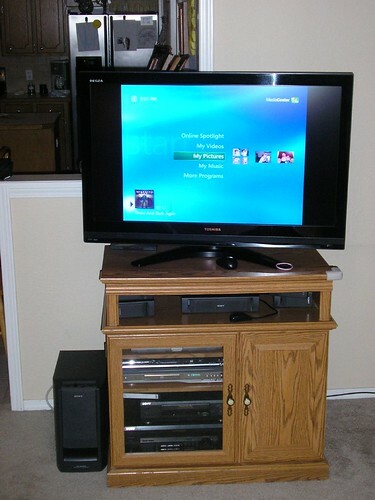 I spent the weekend setting up our HTPC. For those unfamiliar, Home Theater PCs are computers that live attached to your entertainment center in your living room, as opposed to on the desk in the office. Use existing resources with minimal purchases. Be able to enjoy at our pictures, home videos, and music content, currently living on my office PC upstairs, from the living room. Host no content on the HTPC itself. It will be a consumer of content hosted elsewhere. In the power settings, set it to not go on standby when the lid is closed. Hook up the TV, remote, mouse, and keyboard to the laptop. In Windows Media Center, set the folders for pictures, videos and music to the share on my desktop. Enjoy all the media from the comfort of the recliner! My office desktop has to be turned on to enjoy the media downstairs. This is because the content is hosted on it. This problem will be solved by the purchase of a 500GB or 1TB NAS that I plan to make later this year. The wireless mouse and keyboard have terrible range and work pretty poorly from the recliner. Not a big deal, since I can do most things with the remote. But still annoying. I’m trying to find a better mouse and keyboard, but so far all of the ones that advertise as long range have terrible reviews. Windows Media Center does not like the video card that came in the laptop. So, it throws up an incompatibility error message when you try to watch videos from the WMC interface. This is especially annoying because Windows Media Player will play the videos just fine. It’s a headache having to go out the WMP to watch the content, but not a big enough one to justify buying a computer with a more compatible video card. I’m beginning to regret all of the content I have bought over iTunes. Sure, I can play iTunes on the HTPC, but the interface isn’t nearly as simple to use with the remote was WMC. All in all I think it was a pretty successful project. I’m still looking for a better mouse and keyboard, so if you know of one please let me know.